Does Israel belong to the Jews, and if so, Who says so? In this 30-minute television program, Zola offers irrefutable reasons why only the Jews are the Holy Land’s rightful owners. He also defeats key arguments that attempt to undermine the Abrahamic Covenant, etc. Merely watching and reviewing this lesson will arm Believer and unbeliever alike to defend Israel’s right to its land. 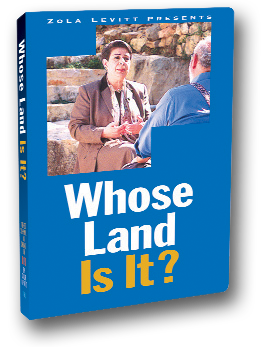 We have combined the two “View from ‘Palestine’” interview programs with Zola’s “Whose Land Is It?” lesson. 00:16 THERE IS NO DIFFERENCE BETWEEN THE JEW AND THE GENTILE. 00:28 CONSIDERING THE TIMES AND SEASONS OF OUR WORLD TODAY, HERE'S ZOLA LEVITT. 00:38 WHERE ZOLA INTENDS TO SPEAK DURING THIS SUMMER AND FALL. 00:42 IF YOU'RE ASSOCIATED WITH ANY UNIVERSITY, PLEASE CONTACT THIS MINISTRY TO SCHEDULE ZOLA. 00:48 I'M GOING TO DISCUSS A SUBJECT THAT I THINK NEEDS DISCUSSED. 01:14 AND THAT IT'S REALLY ARAB LAND AND IT BELONGS TO PALESTINIAN PEOPLE. 01:28 IS SIMPLY NOT THE TRUTH THAT THIS DISCUSSION IS NECESSARY. 01:38 AND THERE'S NO QUESTION OF JEWISH OWNERSHIP OF ISRAEL. 01:42 FIRST OF ALL, THEY ARE THE ONLY PEOPLE IN THE WORLD WITH A LAND GRANT TO THE LAND OF ISRAEL. 02:06 AND CARBON DATED AT 200 B.C. THEY REPEAT THE LAND GRANT. 02:12 IN OTHER WORDS, ONE DOESN'T HAVE TO BELIEVE THE BIBLE. 02:15 THIS IS AN ANCIENT FIND. THIS IS ARCHAEOLOGY. 02:19 THERE IN PLAIN WRITING IS THE IDEA THAT THE JEWISH PEOPLE GET THE LAND OF ISRAEL. 02:25 YOU DON'T HAVE TO EVEN BELIEVE THAT IT'S TRUE. 02:32 THERE WAS A LAND OF ISRAEL AND IT WAS GIVEN TO THEM. 02:40 AND GAVE A TITLE TO SOME PEOPLE CALLED JEWS OUT OF THE COUNTRY OF ISRAEL. 02:48 THE WHOLE WORLD RECOGNIZES THIS CONCEPTION OF PRIOR TITLE. 02:53 THE DEAD SEA SCROLLS WERE WRITTEN 200 B.C. 02:59 MOHAMMED WAS NOT TO BE BORN UNTIL 600 A.D. THAT'S 800 YEARS LATER. 03:06 THERE'S NO QUESTION OF WHAT TITLE IS PRIOR. THE JEWISH TITLE IS PRIOR. 03:11 THE IDEA THAT A NATIVE PEOPLE ARE IN A LAND IMMEDIATELY IMPLIES PRIOR TITLE. 03:20 IN THE UNITED STATES, IN OUR HISTORY, WE HAD NATIVE PEOPLE HERE. 03:30 IS NATIVE AMERICANS, BECAUSE WE ALL ADMIT THAT THEY WERE HERE FIRST. 03:40 AND WE'VE OCCUPIED IT, THEY WERE THE ORIGINALS.THE INDIANS WERE NEVER CALLED OCCUPIERS. 03:52 WE'RE HAVING PROBLEMS OUT HERE; THE INDIANS ARE TRYING TO OCCUPY THIS LAND. 03:57 THE INDIANS CAME WITH THE LAND. 03:59 THEY ALSO DID NOT REPORT THAT THE INDIANS WERE SETTLERS. THAT DOESN'T MAKE ANY SENSE. 04:07 LIKEWISE, IN ISRAEL THE ISRAELIS ARE THE INDIANS, SO TO SPEAK. 04:12 THEY ARE THE NATIVE PEOPLE, THE OLDEST PEOPLE BY FAR. 04:21 BUT WE DON'T HAVE TO RELY ON THE BIBLE. 04:23 I'M GOING TO PRESENTLY DISCUSS THE HISTORY OF THE PLACE AND THE ARCHAEOLOGY THAT HAS BEEN FOUND. 04:36 AND WOULD FIND THE SAME THING - THAT THE JEWS ARE NATIVE TO THE LAND. 04:45 SETTLING THE PLACE AFTER NOMADS, AFTER CANAANITES, JEBUSITES, PEOPLE OF THAT SORT. 04:53 THEY WERE THERE ESSENTIALLY FIRST, BUT THEY WERE NOT ARABS AT ALL. 04:57 THERE WERE NO ARABS IN THE LAND FOR CENTURIES LATER. 05:03 SO THE JEWISH PEOPLE ARE ACTUALLY THE ORIGINALS AND THEY HAVE THE GRANT TO THE LAND. 05:19 OR EVEN A FICTIONAL GRANT OR A FABLED GRANT, NO KIND. 05:25 THE JEWISH PEOPLE ARE THE ONLY ONES WITH A GRANT TO LAND, THAT GRANT IS TO THE LAND OF ISRAEL. 05:34 IT WAS GIVEN FOR MORE THAN THE JEWS HOLD TODAY. 05:54 TAKING IN EVEN THE CITY OF DAMASCUS, MOST OF JORDAN, THE SOUTHERN AREAS AND THE DESERTS. 06:01 IT'S MUCH LARGER, AS GIVEN TO THE JEWISH PEOPLE THAN THEY HAVE TODAY. 06:09 THAT THEY ARE SETTLING FOR FAR LESS THAN THEY WERE GIVEN. 06:13 EVEN THIS IS ATTEMPTED TO DENY TO THEM. 06:19 NOW, TO THE HISTORY. 06:21 LET'S SUPPOSE SOMEONE SAID, OK, THE SCRIPTURE IS SIMPLY JEWISH WRITING, IT'S PARTISAN TO THEM. 06:28 THEY PROBABLY HAVE EDITED IT A HUNDRED TIMES AND CHANGED THINGS AROUND, IF YOU LIKE. 06:41 THE ENTIRE HISTORY BOOKS, THE GENESIS LAND GRANT AND ALL OF IT IS IN THE DEAD SEA SCROLLS. 06:46 THOSE ARE WRITTEN MATERIALS. THEY CAN NOT HAVE BEEN FAKE. THEY'VE BEEN CARBON DATED. 06:50 YOU HAVE TO SETTLE THAT 200 B.C. THEY DID HAVE A GRANT. 06:58 OBSERVED THAT THE JEWS OCCUPIED THE LAND OF ISRAEL. 07:02 IT WAS JEWISH LAND. THERE'S NO QUESTION OF IT. 07:05 I HAVE HERE, A COPY OF A ROMAN HISTORY BOOK, "JOSEPHUS, THE ESSENTIAL WRITINGS". 07:12 IT SAYS ON THE COVER, AN ILLUSTRATED EDITION OF JEWISH ANTIQUITIES AND THE JEWISH WAR. 07:29 WHO WAS A ROMANIZED HISTORIAN OF THE 1ST CENTURY. 07:40 THERE SIMPLY WERE NO PALESTINIANS IN THIS WORLD. 07:43 THE COUNTRY WAS NAMED PALESTINE BY THE EMPEROR HADRIAN IN 135 A.D., LATER THAN JOSEPHUS. 07:51 AGAIN, THERE WERE NO ARABS INVOLVED. 08:00 ENEMIES PERENNIALLY OF THE JEWISH PEOPLE. 08:04 IT WAS ANOTHER ONE OF THOSE FINAL SOLUTIONS TO THE JEWISH PROBLEM. 08:07 THE FACT IS THE PALESTINIANS HAD NOTHING TO DO WITH THE ARABS. THEY WERE GREEKS. 08:13 THEY CAME FROM THE ADRIATIC AREAS AND FROM CYPRESS. 08:17 THEY PURSUED MARINE VENTURES ALONG THE COAST LANDS OF THE EAST, EVERYWHERE IN THE MIDDLE EAST. 08:24 THEY WERE IN TYRE, SIDON, DOWN TO GAZA AND SO FORTH. 08:29 THEY OFTEN TIMES FOUGHT WITH THE PEOPLE INLAND TO PROTECT THEIR INVESTMENTS. 08:34 THERE WERE NO ARABS INVOLVED IN THIS. 08:38 NOT UNTIL THE BIRTH OF MOHAMMED, DID THE ARABS BEGIN TO TAKE AN INTEREST IN THE COUNTRIES AROUND THEM. 08:47 OF COURSE, ISRAEL WAS ONE OF THOSE. 08:49 BUT THEY DID NOT CALL THEMSELVES PALESTINIANS THEN. 08:52 THE FACT IS THE ARABS DID NOT CALL THEMSELVES PALESTINIANS UNTIL 1964 A.D.
09:06 AND THE ARABS REJECTED THE NAME. THEY DID NOT WANT TO BE CALLED PALESTINIANS. 09:11 THAT WAS A JEWISH TERMINOLOGY. 09:29 VARIOUS CLIMATES, ALMOST SEMI-TROPICAL, ARID IN SOME PLACES. 09:37 THEY SHOWED THEM HOW TO PLANT THE VINEYARDS. 09:40 THE STORY IS TRUE. BUT ALL OF THOSE PALESTINIAN FARMERS WERE JEWISH. 09:45 THERE WAS NO INDIGENOUS PALESTINIAN CULTURE; NO GOVERNMENT, NO COUNTRY. 09:52 A LEGITIMATE GOVERNMENT LEAVES THINGS BEHIND. 09:56 THERE ARE NO DOCUMENTS, NO CURRENCY, NO LEGAL FORMS, NO STATIONARY IF YOU WILL, NOTHING. 10:04 THIS IS COMPLETELY A MODERN PEOPLE, IF IT'S A PEOPLE AT ALL. 10:16 PRINCIPALLY SINCE 1948 WHEN THE JEWS STARTED TO BUILD A MODERN NATION. 10:20 IT HAPPENS IN MANY PLACES IN THE WORLD. 10:25 WHERE MEXICANS CAME TO TAKE JOBS AND CENTRAL AMERICANS AND SO ON. 10:29 IN FLORIDA WHERE CUBANS CAME AND THE WORKERS ARE WELCOME. 10:34 THEY'RE PAID A DAYS WAGE FOR A DAYS WORK. THEY'RE WORK IS NEEDED. 10:37 THEY ARE USUALLY SKILLFUL AND COOPERATIVE. SO THEY WERE HERE IN AMERICA. 10:47 THEN BEGAN TO CHAFE UNDER WHAT THEY CALL AN OCCUPATION. 10:52 IT WAS NOT AN OCCUPATION. THE JEWS HAD SIMPLY RETURNED TO THEIR NATIVE LAND. 11:14 OCCUPY THIS CONTINENT - MILITARY CONQUEST. 11:18 I'LL BE BACK AFTER THIS. 11:29 AND ASSEMBLE YOU OUT OF THE COUNTRIES WHERE YOU'VE BEEN SCATTERED. 11:32 I WILL GIVE YOU THE LAND OF ISRAEL, THE WILDERNESS AND THE DRY LAND SHALL BE GLAD. 11:38 THE DESERT SHALL REJOICE AND BLOSSOM AS THE ROSE. 11:42 YOU SHALL KNOW THAT I AM THE LORD WHEN I BRING YOU INTO THE LAND OF ISRAEL. 11:51 OUR TOURS OF ISRAEL HAVE CONTINUED FOR 30 YEARS. 11:55 I TOOK MY FIRST ONE IN 1973 AND THIS IS WHERE I PICKED UP THE KNOWLEDGE OF THE PLACE. 12:16 JOURNALISTS, PEOPLE ON THE STREET, MERCHANTS AND OF COURSE THE ISRAELI PEOPLE. 12:24 I'VE LEARNED A LOT. 12:27 I'M ABSOLUTELY SHOCKED BY WHAT'S GOING ON ON OUR CAMPUSES AND IN OUR NEWSPAPERS. 12:32 THERE SEEMS TO BE ALMOST NO ATTEMPT TO GIVE A TRUTHFUL ESTIMATION OF WHAT'S GOING ON OVER THERE. 12:41 I SAID I'D DISCUSS THE ARCHAEOLOGY AND THAT'S A FASCINATING PART OF ISRAEL. 12:51 WHICH IS THOUSANDS OF YEARS OF HISTORY IN THE GROUND. 13:04 OR A BURIAL GROUND USUALLY MORE RECENT, ARROWHEADS AND TOMAHAWKS. 13:09 THAT'S ABOUT THE HISTORY THAT WE CAN FIND HERE. 13:18 EVEN PREDATING KING SOLOMON, KING DAVID AND SO ON. 13:36 LARGE PILLARS, BIG, MASSIVE PILLARS FROM THE TIME OF ABRAHAM 10 0R 15 FEET HIGH. 13:45 THIS IS SOME BUILDING FOR 2,000 B.C. 13:49 4,000 YEARS AGO A LOT OF THE WORLD WAS STILL LIVING IN THE FORESTS. 13:52 IN ISRAEL, PEOPLE WERE BUILDING STRUCTURES. 13:58 ABRAHAM APPARENTLY SAW THESE PILLARS AND IT CLEARS UP SOMETHING OF A MYSTERY. 14:03 THE BIBLE STORY IS THAT ABRAHAM WAS TO TAKE ISAAC TO MT. MORIAH AND OFFER HIM IN SACRIFICE. 14:10 I THINK EVERYBODY IN THE WORLD MUST KNOW THE STORY. 14:12 BUT HOW DID HE FIND THIS PARTICULAR MOUNTAIN? 14:15 THEY CAME FROM BEERSHEBA FROM THE SOUTHERN SIDE OF JERUSALEM. 14:24 FROM WHERE YOU CAN VIEW THE CITY OF JERUSALEM. 14:32 1,000 YEARS AFTER ABRAHAM, BECAME THE CITY OF DAVID. 14:36 RIGHT THERE THE PILLARS STOOD, APPARENTLY, BECAUSE THEY HAVE FALLEN WHERE THEY STOOD. 14:42 THEY HAVE BEEN IDENTIFIED AS BELONGING TO THE TIME. 14:47 WHEN ABRAHAM SAW THOSE HE MUST HAVE HEADED STRAIGHT THERE. 15:03 BECAUSE IN THOSE DAYS THE WORSHIP PLACE WAS CALLED THE HIGH PLACE. 15:08 IT WAS ALWAYS THE HILL ABOVE THE CITY, IT LOOKED DOWN ON ALL THE PEOPLE. 15:19 WAS PUT UP ON THIS HIGH HILL ABOVE THE CITY. 15:22 FROM THE CITY OF DAVID, THAT IS THE HILL THAT ONE SEES, MT. MORIAH. 15:26 THE MT. OF OLIVES IS ON ONE SIDE. IT'S HIGHER. 15:55 ARE ALTARS FROM JOSHUA'S TIME WITH ANCIENT HEBREW WRITING. 16:00 THE STONE PROVING THE HOUSE OF DAVID. 16:03 IT SAYS IN PLAIN ARAMAIC, AND I COULD READ IT, IT'S VERY CLEAR, THE HOUSE OF DAVID. 16:19 AND THAT HE DIDN'T REALLY LIVE. HE WAS ABOUT THAT SAME TIME. 16:28 I WAS STUDYING FOR A DOCTORATE THERE. 16:38 AND HE WAS PROBABLY A MYTHOLOGICAL CHARACTER AND THIS SORT OF THING. 16:43 WELL, THAT'S NOT TRUE. 17:04 BUT CARVED IN THE ARAMAIC LANGUAGE SO THAT IT'S CLEAR TO READ. 17:07 THAT IS EVIDENCE THAT DAVID EXISTED. 17:30 AS OF 3,500 YEARS AGO AND 3,000 YEARS AGO. 17:35 NOW THE DEAD SEA SCROLLS, THEY ARE ONE OF THE ARCHAEOLOGICAL FINDS OF ALL TIME. 17:41 THAT IS, ONE WANTS TO FIND THE WRITING IN THE GROUND. THAT'S WONDERFUL. 17:49 WE BROKE A CODE AND WERE ABLE TO READ HIEROGLYPHICS AND OTHER LANGUAGES READILY. 17:53 I EXAMINED THE ROSETTA STONE. IT'S IN THE BRITISH MUSEUM. 17:56 IT'S A LARGE PIECE OF STONE WITH CLEAR WRITING ON IT. 18:00 BUT IT'S ONLY ONE STONE WITH ABOUT 4 PARAGRAPHS OF WRITING. 18:09 THE ENTIRE BIBLE, OTHER NOVELS, AN ALLEGORY OF THE BATTLE OF SONS OF LIGHT AND SONS OF DARKNESS. 18:24 AND FOR 50 YEARS AFTERWARD ARE WRITTEN DOWN IN HEBREW. 18:30 THIS, AGAIN, PROVES PRIMACY OF THE JEWISH PEOPLE IN THE LAND. 18:40 NAZARETH, BETHLEHEM, JERUSALEM ARE OBVIOUSLY JEWISH CITIES. 18:45 ARABS LIVE IN ALL 3 AND ARE WELCOME, BECAUSE OF THE TIMES. 18:52 THOSE ARE JEWISH CITIES THAT HAVE BIBLE NAMES. THAT'S ALL THERE IS TO THAT. 18:57 THE ARABS DID NOT BUILD THOSE CITIES OR MOST ANY CITY IN ISRAEL. 19:08 AND IT ALWAYS WAS, BUT THE MUSLIMS CLAIM IT TOO. 19:12 BUT JERUSALEM IS NOT GIVEN IN THE KORAN. IT'S NOT MENTIONED EVEN ONCE. 19:18 IT'S MENTIONED MORE THAN 700 TIMES IN THE BIBLE. 19:27 A PLACE DISTANT FROM MECCA IS ALL WE CAN ASCERTAIN. 19:39 SIMPLY BECAUSE ISRAEL HAS BEEN THE HARD NUT TO CRACK IN THE MIDDLE EAST. 19:47 BUT THEY NEVER REALLY HAVE BEEN ABLE TO PUT THE JEWS OUT OF ISRAEL. 19:57 AND SUNDRY PEOPLE DID FROM EVERYPLACE, ALL COUNTRIES AROUND THE MIDDLE EAST. 20:09 AS THEY DID WHEN THEY WERE THERE 3,000 YEARS AGO, THEN JERUSALEM WAS JEWISH ONCE AGAIN. 20:16 THEY HAVE PERSISTED THERE. 20:29 IT WOULD BE A VALUABLE BOOK OF PROPHECY. 20:31 IT WOULD BE SOMETHING TO RECKON WITH. 20:34 ARCHAEOLOGY IS FOOLPROOF. YOU CAN'T FAKE IT. 20:49 BUT IT'S TOO PREPOSTEROUS WHEN ARCHAEOLOGISTS WITH NO AXE TO GRIND, DIG INTO THE GROUND. 20:56 THEY DATE THINGS WITH CARE. 20:58 SOME OF THEM ARE VERY SKEPTICAL OF SCRIPTURE, OBVIOUSLY, IN ISRAEL. 21:03 WE LEARN BIBLE MINIMALISTS AND BIBLE MAXIMALISTS. 21:09 THE MINIMALISTS SAY THE BIBLE IS NOT TO BE RELIED ON. 21:12 IT'S JUST A RELIGIOUS BOOK, BEAUTIFUL POETRY, ETC. 21:16 IT'S WELL DONE, BUT NOT TO BE RELIED ON AS A SCIENTIFIC TEXT AND THEY DON'T RELY ON IT. 21:21 NEVERTHELESS, THEY DON'T FIND ARCHAEOLOGY THAT DISPROVES IT EITHER. 21:26 THE BIBLE MAXIMALISTS SAY USE THE BIBLE WHEN YOU DIG BECAUSE IT WILL TELL YOU WHERE TO DIG. 21:36 ACCORDING TO WHERE THE BIBLE SAYS IT WILL GROW WELL AND THEY PROSPER DOING THAT. 21:41 SO YOU HAVE BOTH VIEWS. 21:43 I'M BRINGING THAT UP PURPOSELY BECAUSE IT'S NOT PARTISAN. 21:47 THE BIBLE SEEMS TO BE A TRUTHFUL BOOK AS FAR AS THAT GOES. 21:51 THEY USE IT IN THAT MANNER. 21:54 NOW, ARCHAEOLOGY, AGAIN, SIMPLY ESTABLISHES PRIMACY LIKE NOTHING ELSE. 22:04 I DON'T THINK IT'S FROM AN ANCESTOR OF MINE, THAT IS, A WHITE EUROPEAN IMMIGRANT. 22:10 I KNOW IT'S FROM THE INDIANS. I KNOW THAT. 22:18 I KNOW IT'S FROM THE JEWS IF THAT HAPPENS IN ISRAEL. 22:22 THE WHOLE WORLD KNOWS IT AND THE WHOLE WORLD RESPECTS THE IDEA OF PRIOR TITLE. 22:28 WHEN YOU BUY A PIECE OF PROPERTY YOU BUY TITLE INSURANCE WITH IT. 22:33 WHAT IS THAT STUFF? IT'S EXPENSIVE. 22:35 WELL, THE INSURANCE COMPANY GUARANTEES THE TITLE TO BE, IN EFFECT, AN ORIGINAL. 22:41 YOU HAVE THE TITLE TO THE PROPERTY AND THERE IS NO PRIOR TITLE. 22:51 AND IF SOMEBODY DOES STEP FORWARD, YOU'VE PAID A PREMIUM. 22:58 OR IN THE END PAY YOU OFF. THEY GUARANTEE THAT YOUR TITLE HOLDS SWAY. 23:04 WELL, THERE'S NO BETTER TITLE THAN A PIECE OF ARCHAEOLOGY IN THE EARTH. 23:08 THERE'S JUST NOTHING TO REPLACE IT. 23:15 BUT ARCHAEOLOGY IS FOOLPROOF. 23:19 NOW, THE LAST POINT - LAND CONQUERED. TT GOES TO THE LAST CONQUEROR. 23:26 THOSE ARE THE RULES IN THIS WORLD. 23:27 THERE HAS TO BE SOME RULES AND THAT'S THE MOST CONVENIENT THING. 23:32 FRANKLY, LAND IN THIS WORLD GOES TO THE GUY WITH THE MOST GUNS. 23:36 THAT'S WHAT HAS HAPPENED FOR CENTURIES. 23:39 THAT'S WHAT HAPPENED HERE IN AMERICA. 23:42 WE IMMIGRANTS HAVE NO REAL RIGHT TO THIS LAND OTHER THAN OUR SOLDIERS WON IT IN BATTLE. 23:55 WHICH IS A COUNTRY THAT WAS IN AN UNFORTUNATE LOCATION AT THE END OF WORLD WAR II. 24:02 THEY WERE SORT OF POLISH AND GERMAN BOTH. 24:05 THEY SPOKE THE GERMAN LANGUAGE, THEY HAD POLISH CUSTOMS, THEY ARE LOCATED BETWEEN THOSE TWO NATIONS. 24:15 THEN THE RUSSIANS SWEPT OVER THEM ON THEIR WAY TO GERMANY AT THE END OF THE WAR. 24:19 THEY WANTED TO BE POLES, RATHER THAN GERMANS, IN ORDER TO BE ON THE WINNING SIDE. 24:25 THEY TOOK THE CASE TO THE WORLD COURT. 24:28 THE WORLD COURT LOOKED AT THE CASE AND DECIDED IT IN THEIR FAVOR. 24:33 THEY ARE POLES NOW BECAUSE THE RUSSIANS, WHO WERE ALLIED WITH POLAND WERE THE LAST CONQUERORS. 24:43 IT'S JUST THAT SIMPLE. 24:48 AND NOBODY'S CALLING TEXAS, MEXICO, WE WERE THE LAST CONQUERORS. 24:53 NOBODY IS CALLING LOUISIANA, FRANCE, WE PURCHASED IT, WE'RE THE LAST THROUGH THERE. 24:59 THEN, WHY WOULDN'T WE DO THAT WITH THE WEST BANK IN ISRAEL, SO CALLED WEST BANK. 25:04 THE JEWS CONQUERED IT LAST IN THE 6 DAY WAR IN 1967. 25:09 THERE'S NO QUESTION OF THAT. THE WHOLE WORLD SAW THAT. 25:13 WHY ARE THEY CALLED OCCUPIERS SINCE THEIR ARCHAEOLOGY IS RIGHT THERE IN THE GROUND? 25:22 WHEN ALL OF THE PROOFS I'VE GIVEN ARE OBTAINED TODAY AND ARE KNOWN BY ALL SIDES? 25:29 PERHAPS THE MEDIA DOESN'T KNOW WHAT I'M SAYING, BUT THEY OUGHT TO. 25:37 THEY'VE GOT MOST OF THE WORLD UP IN ARMS ABOUT ISRAEL AND THE WHOLE THING IS TERRIBLY UNFAIR. 25:44 IT'S UNFAIR TO BOYCOTT A DEMOCRACY. 25:47 IT'S UNFAIR TO DIVEST FROM A GOING FREE COUNTRY IN FAVOR OF A DICTATORSHIP. 26:05 IN A CHURCH, IN A CIVIC MEETING. 26:07 I'M OPEN AND I WILL NOT CHARGE ANY FEE OR TRAVEL EXPENSE TO DO THAT. 26:12 I FEEL THAT THIS IS A NECESSARY THING TO SAY EVERYWHERE AS LONG AND LOUD AS I CAN. 26:26 ALL POINT TO JEWISH OWNERSHIP OF THE LAND OF ISRAEL. 26:31 THERE'S NO OTHER QUESTION AND NO OTHER CLAIM THAT CAN HOLD UP TO THE JEWISH CLAIM. 26:50 RIGHT NOW WHILE WE READ THESE THINGS IN THE MEDIA. 26:55 IF YOU'RE ASSOCIATED WITH AND UNIVERSITY, PLEASE CONTACT THIS MINISTRY TO SCHEDULE ZOLA.